(From left) Hong Jukhee, Director of Operations, CIMB ASEAN Research Institute; Datuk Isham Ishak, Deputy Secretary General (Trade), Ministry of International Trade and Industry (MITI); Tan Sri Dr. Munir Majid, Chairman of CIMB ASEAN Research Institute (CARI) and President of the ASEAN Business Club during the CARI Briefing session on “ASEAN Economic Community 2018 priorities and progress”. 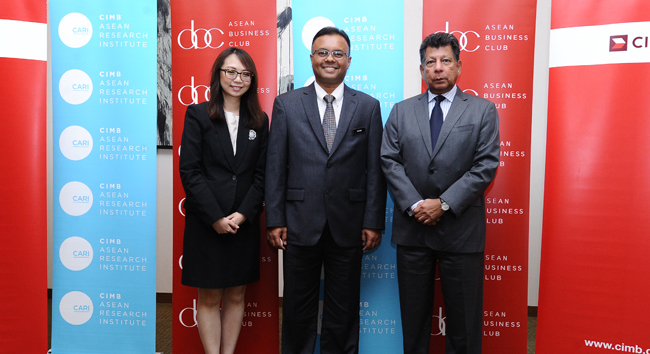 The briefing was organised by CARI on 31 May 2018, in collaboration with the ASEAN Business Club. (Kuala Lumpur, 6 June 2018): Progress towards realising the goals of the ASEAN Economic Community (AEC) 2025 remains steady and ASEAN will continue to work closely to implement the deliverables under the AEC 2025 agenda. Singapore as the Chair of ASEAN in 2018 had identified 12 economic priority deliverables focusing on innovation and digital economy. ASEAN will continue the work on improving trade facilitation, deepening services and investment integration, cultivating a conducive regulatory environment and progressing ASEAN’s external relations. These were highlighted by Datuk Isham Ishak, Deputy Secretary General (Trade) Ministry of International Trade and Industry (MITI) Malaysia at the Inaugural CARI Briefings titled, “ASEAN Economic Community 2018 Priorities and Progress” which was organised by the CIMB ASEAN Research Institute (CARI) on 31 May, in collaboration with the ASEAN Business Club. According to Datuk Isham, the key thrusts and economic priority deliverables for Singapore’s ASEAN Chairmanship in 2018 are driven by the overall thematic priority of “Resilience and Innovation” with the key economic objective of deepening regional connectivity to position ASEAN as a region for seamless economic activity and growth opportunities, especially in e-Commerce and the digital economy. ASEAN is currently undertaking a study to assess the readiness of ASEAN and individual ASEAN Member States in addressing the challenges while seizing opportunities brought about by the Fourth Industrial Revolution (4IR). He further added that ASEAN Good Regulatory Practice (GRP) is one of the new elements introduced in AEC 2025 and ASEAN Work Plan on Good Regulatory Practice (GRP) 2016-2025 was endorsed in April 2017. ASEAN is currently drafting the GRP Core Principles to further implement GRP in ASEAN with the aim to reduce the regulatory burden and improve the overall regulatory coherence and cooperation in the region. According to Datuk Isham, ASEAN has implemented an enhanced monitoring framework which includes outcomes monitoring and impact assessment, annual prioritisation and country visits. The annual prioritisation of AEC Blueprint 2025 measures will provide opportunities for regular reviews to ensure proper implementation and continued relevance. Country visits were conducted in Lao PDR as a pilot project in 2016, whereas two comprehensive country visits were carried out in Indonesia and the Philippines in 2017. For 2018, country visits will be carried out in Brunei and Malaysia. One of ASEAN’s immediate priorities is to complete negotiations on the Regional Comprehensive Economic Partnership (RCEP), a free trade agreement that is built upon the existing FTAs of ASEAN with its six dialogue partners – Australia, China, India, Japan, New Zealand, and South Korea. The negotiations have been ongoing for over five years with 22 rounds of negotiation. “Early implementation of the RCEP will enable the business sector to tap into the huge potential that the 16 countries can offer collectively, while also contributing to global economic growth. ASEAN will continue to demonstrate centrality and leadership to advance the negotiations and conclusion of the RCEP,” said Datuk Isham.